The establishment of small and medium enterprises along with upcoming government infrastructure projects such as metro rails, smart cities and expansion of state and national highways are expected to fuel the demand for diesel gensets in Thailand over the coming years. Strengthening telecom infrastructure, increasing residential societies and the expansion of business parks in the country would further drive the growth of diesel genset market in such markets in the future. The development of the Eastern Economic Corridor, with a total investment of more than $50 billion, would increase urbanization, regional commercial centers and tourism spots in the Eastern Region of Thailand and create more demand for diesel gensets. Projects such as the U-Tapao International Airport, Map Ta Phut Port (3rd Phase) and the Sattahip Commercial Port would also contribute towards the increase in the market for diesel gensets in Thailand over the next six years. 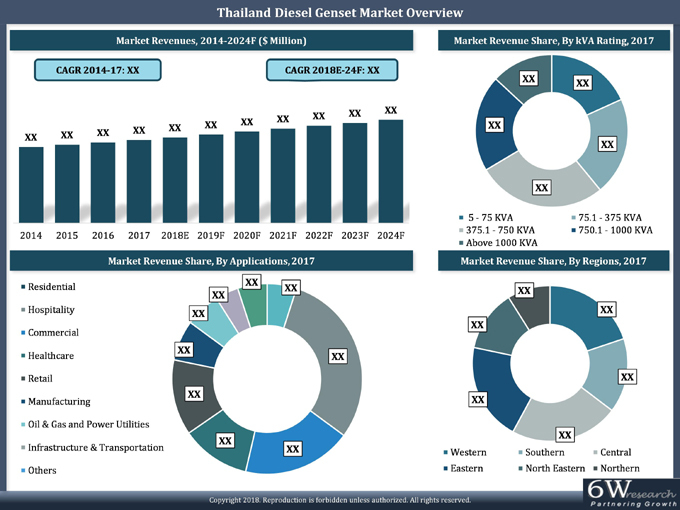 The Thailand diesel genset market report thoroughly covers Thailand diesel genset market by KVA ratings, applications and regions. Thailand diesel genset market outlook report provides an unbiased and detailed analysis of the Thailand diesel genset market trends, opportunities / high growth areas and market drivers which would help the stakeholders to device and align their market strategies according to the current and future market dynamics. 14.3 Deutz Asia-pacific (Pte.) Ltd.
14.4 Denyo United Machinery Pte. Ltd.
14.5 Mitsubishi Heavy Industries (Thailand) Ltd.
14.6 FG Wilson Asia Pte Ltd.
14.10 Namsang Engineering Co. Ltd.